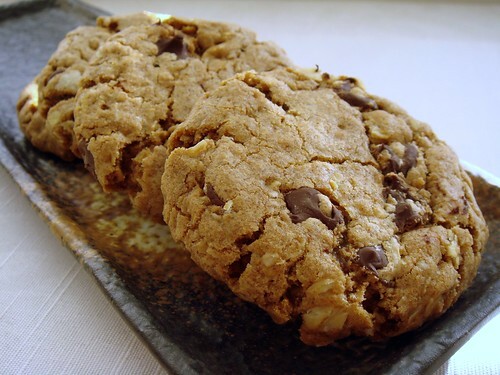 I read about this unusual chocolate chip cookies a long while ago made with mesquite flour. When I finally visited Austin, I didn't waste time and hit up Central Market immediately to pick up a couple of bags. This flour is so fragrant! The smell is not so much smokey but a warm mellow cocoa aroma. My preference for chocolate chip cookies leans toward soft, cakey, and chewy. This recipe is right up my alley. Each ball of dough was about the size of a golf ball and it didn't spread much in the oven (11 minutes for me). As soon as they came out of the oven, I took a flat bottom bowl and a piece of parchment paper to flatten the cookies. That was my secret to getting perfectly round and thick cookie. Recipe adapted from David Lebovitz (because he has the ingredients by weight) who in turn adapted from Heidi Swanson's Super Natural Cooking. I used all-purpose flour and a half/half mix of granulate sugar/light brown sugar. Mixing these two types of sugar for a great texture and flavour for chocolate chip cookies is a trick that I remember reading from Cook's Illustrated a few months ago. My batch yielded 34 cookies even though there were so much dough. This matches the yeild in Swanson's recipe but way off from Lebovitz's. I'm not complaining though because the extra thickness help keep these cookies soft and moist. However, the most nifty trick I discovered after baking this batch of cookies is how to pack them safely for some rough travels. You see, these cookies flew with me in the checked luggage to be shared with a group of skating friends. In one of my more brilliant moments, it occured to me to pack them with miniature marshmallows. These soft candies are great for cushioning and filling in any empty space in the container. Besides, their flavours do not affect the cookies at all. If you're really keen, you can even use them as sandwich cookies filling (not that I tried...but hey, it's all about options!). All of my chocolate chips cookies arrived in perfect condition and just as moist as the day they were baked. 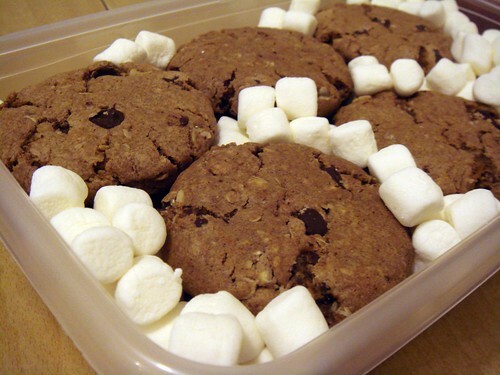 Next time you need to send soft cookies by mail, I highly recommend that you consider using miniature marshmallows!